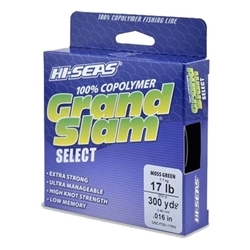 Hi-Seas Grand Slam Select is a 100% Copolymer fishing line that combines superior strength with maximum manageability. This line is produced from the highest quality copolymer, super easy to handle and provides smooth, agile casting on bait casters and conventional reels. The Grand Slam Select comes in a Moss Green color which provides excellent camouflage. Professional anglers rely on the best quality gear to win championships. Hi-Seas Grand Slam Select is the professionals' choice in monofilament line because it delivers all-star performance, strength, and dependability.